Today Newt Gingrich is the co-host of CNN’s Crossfire, where he continues to advocate bold policy ideas. But there is a lot more to Newt Gingrich than these remarkable achievements. As an author, Newt has published twenty-four books including 14 fiction and nonfiction New York Times best-sellers. Non-fiction books include his latest, A Nation Like No Other, in addition to Ronald Reagan: Rendezvous with Destiny, To Save America, Rediscovering God in America, 5 Principles for a Successful Life, Drill Here, Drill Now, Pay Less, Real Change, A Contract with the Earth, Winning the Future: A 21st Century Contract with America, To Renew America, Lessons Learned the Hard Way, Saving Lives & Saving Money, Window of Opportunity, and The Art of Transformation. He is also the author of a series of historical fiction books including, Gettysburg, Grant Comes East, Never Call Retreat: Lee and Grant the Final Victory, 1945, Pearl Harbor, Days of Infamy, To Make Men Free, To Try Men’s Souls, Valley Forge, and his latest, Victory at Yorktown. These novels are active history studies in the lessons of warfare based on fictional accounts of historical wartime battles and their aftermaths. Newt and his wife, Callista, host and produce historical and public policy documentaries. Recent films include A City Upon A Hill, America at Risk, Nine Days That Changed The World, Ronald Reagan: Rendezvous with Destiny, Rediscovering God in America, Rediscovering God in America II: Our Heritage,and We Have the Power. 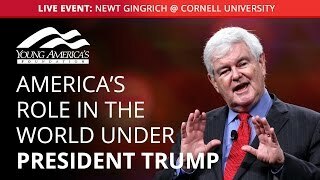 In his post-Speaker role, Newt has become one of the most highly sought-after public speakers, accepting invitations to speak before prestigious organizations throughout the world. Because of his own unquenchable thirst for knowledge, Newt is able to share unique and unparalleled insights on a wide range of topics. His audiences find him to be not only educational but also inspirational. To foster a modern health system that provides better outcomes at lower cost, Newt launched the Center for Health Transformation in 2003, and continued there in a leadership role until he stepped down in 2011 to seek the Republican nomination for President of the United States. Recognized internationally as an expert on world history, military issues, and international affairs, Newt served as a Member of the Defense Policy Board. He was the longest-serving teacher of the Joint War Fighting course for Major Generals. He also taught officers from all five services as a Distinguished Visiting Scholar and Professor at the National Defense University. Newt was a member of the Terrorism Task Force for the Council on Foreign Relations. In 2005, Newt co-chaired the Task Force on U.N. Reform, a bi-partisan Congressional effort to reform the United Nations. In 1999, Gingrich was appointed to the United States Commission on National Security/21st Century, Hart/Rudman Commission, to examine our national security challenges as far out as 2025. The Commission’s report is the most profound rethinking of defense strategy since 1947. The report concluded that the number one threat to the United States was the likelihood over the next 25 years of a weapon of mass destruction – nuclear, chemical, and/or biological – being used against one or more major cities unless our defense and intelligence structures underwent a massive transformation. That report was published six months before September 11. Because of his work on the Hart/Rudman Commission, Newt Gingrich is credited with the idea of a Homeland Security Agency with a Secretary to serve on the Cabinet level. President George W. Bush later created the Department of Homeland Security. From 2007 until his 2012 presidential bid, Newt served as General Chairman of American Solutions for Winning the Future. He has also been a Senior Fellow at the American Enterprise Institute in Washington, D.C., and a Distinguished Visiting Fellow at the Hoover Institution at Stanford University in Palo Alto, California. Newt is also a news and political analyst appearing regularly on cable and broadcast news programs. Newt Gingrich is a leading advocate of increased federal funding for basic science research. In 2001, he was the recipient of the Science Coalition’s first Science Pioneer award, given to him for his outstanding contributions educating the public about science and its benefits to society. Exclusively represented by Worldwide Speakers Group.